The Emerald Cape was the sight of Fairhaven's original lighthouse, which still stands and functions. The cape was so named because of its lush greenery and for the greenish moss and algae which cover many of its rocks. Today, rich houses dot the slopes of the cape, though it is hardly a populous region. The Emerald Cape lighthouse is made of sturdy, native granite, painted white, but the original lens had a greenish tint due to impurities in the glass. Many ship captains and pilots have said that the greenish light is more visible, and so the lenses are now intentionally made with the greenish tint. Emerald Cape also has a public ferry to some of the Bel Vista islands, though many areas on the Bel Vista Islands are private property, and inaccessible to the general public. Well, it's done now. 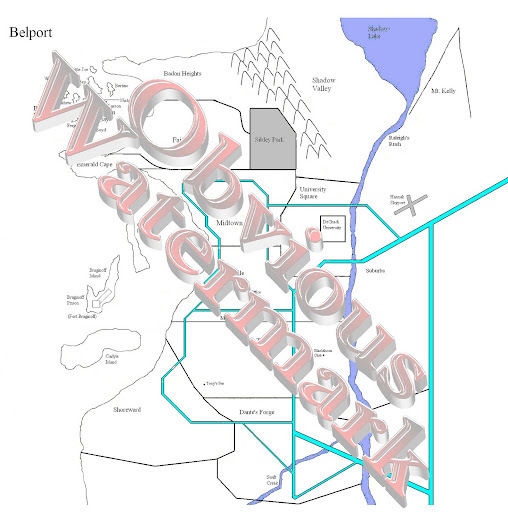 The map of my city, Belport, is complete. Well, mostly. I hope to someday get street names onto it, but this will work for now. It was quite difficult to come up with at first. I initially wanted a neighborhood approach like Chicago, Frisco, and of course New York, but after seeing just how many neighborhoods there were in such a small space, I decided to go for something more along the lines of boroughs. Smaller towns that ended up merging together into one city. I may go back into each area of the city to flesh out neighborhoods for it, but that's a debate for later. I rather enjoy each area of the city keeping the name it had throughout the city's history. I will likely put up the history I developed a piece at a time, but now, hit the jump to see the map. Well, I'm a little late to the party, only hearing about this particular news item from a friend last week, which is why I spent a few days looking into it, then mulling it over to come to a conclusion. The issue was a comment Stephen King made about Stephenie Meyer's writing. First, I'm not tackling that issue. I don't know King's or Meyer's writing to make any kind of comment. Much of it is up to personal preference, as well. In my book, Hemingway cannot write. His prose is too simplistic and subject matter very boring for me. Nathaniel Hawthorne should be denigrated instead of praised in my opinion, but I know there are people that love both of them. I have no problem with that. Likewise, I have no problem with people loving both Meyer and King. However, there's something else that disturbs me, and I simply can't remain quiet on it any longer. There seems to be a common thread in the comments of many, if not the majority, of Meyer's supporters, and that is quite a few of them write and read at the level of her novels. I've perused the comments here and here and cringe at the poor grammar, style, and rationale within them. That's not to say that there aren't quite a few who express themselves adequately and rationally, but those aren't as numerous. I see many laden with texting conventions that do not belong in any kind of written argument, and I long to send Mr. Period (NSFW language) in to attempt the problem, but think Cap might lose his temper. Many of the commenters do not even address the topic at hand and simply write what they like most about Meyer's books. Others simply spew hate towards King in language more reminiscent of an elementary school yard than by young (and not so young) adults. Furthermore---I'm not sure if this is more disturbing or not---whole legions have no idea who Stephen King is, and do not bother to take the two minutes necessary to use the Internet to find out even basic facts about him, such as the books he's authored, the ranking of those books in best-seller charts, the movie adaptations from those books, and the man's estimated wealth. The level of ignorance given off by Meyer's supporters is palpable, and it frightens me. I'm frightened because I believe that many of them will never go on to realize that there is much more and better literature out there. I'm not talking about King, either. I've never read his works. I'm talking about the likes of Shakespeare, Milton, Twain, Homer, Dickens, and a host of others it would take me far too long to list. I do not begrudge Meyer at all. I think it's wonderful that she has written, published, and become popular, yet I think that the true worth of books is that they inspire us to move on and read more, yet the sense I get from many of these supporters is that they will never move beyond Meyer's young adult books to the incredible universe of stories out there. They will never see the majesty of two star-crossed lovers so reminiscent of Twilight in Romeo and Juliet---by the by, I believe that R&J (as Will let's me call it) is one of the Bard's more mediocre works. For my money, go with A Midsummer Night's Dream, Taming of the Shrew, Hamlet, Julius Caesar, and King Lear. I suppose here at the end I just want to appeal to those who do read and adore Meyer's works to move beyond your beloved series and discover what else is out there. The world of literature is so much richer than one author and one series that it should be explored. I applaud anyone who reads voraciously, but don't close the door off to other books. If you enjoyed Twilight, consider Romeo and Julie, or perhaps even Bram Stoker's Dracula. Look at the stories you've read and loved and look for more of them. You may just find that other works speak more truly than what you've read before. Well, another month gone. The time seems to go by so quickly now, and my totals seem to dwindle now that I'm also throwing revision into the mix. Also, I've had some difficulty with a cold and a sore back, not to mention my teaching, which has taken a toll in terms of time, but I'm still getting a goodly amount done. With all the extra things pulling at my time, it's been difficult to stay disciplined, especially on the weekends when I just want to crash. Not too long ago I just let writing for the day go after pushing it aside all day until no more time was left. I'm working on finding the time and forcing the writing out of me even on those days when I just want to veg. If nothing else, I should take that time and use it to do some revision to at least remain somewhat productive towards writing. I think something else I'm having difficulty with is the third book. I don't have Halloween Scourge mapped out yet---though I haven't with the others, either---and I think I need to spend some time fleshing out the story some more in an outline than blindly writing. Of course, the early parts of the stories always seem boring to me as I'm trying to set everything up, so I'll just keep plowing through until inspiration strikes. I've also started on another short story with my intrepid hero, which I'm having quite a bit of fun with thus far. I'll be posting it up when finished, probably in a couple of weeks. I've also finished the map and the short history of it. The map should be coming up soon, and I think I may slowly release the histories of each section of the city to get into the habit of more regular posting here. Until then, here are the monthly charts.